Inspired by cave paintings, flashlights, early animation devices and visual music, I'd like to create a space where an audience can interactively create visuals to accompany a live musical performance. 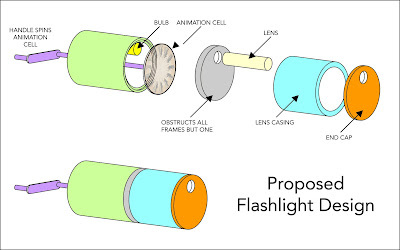 I will design a hand cranked animation flashlight that essentially allows one to project a simple animation cycle. 15-20 people will be given these flashlights and invited into a fort made out of paper or blankets. While a live group of musicians plays campfire jingles the audience will be invited to project their animated flashlights onto the fort walls. 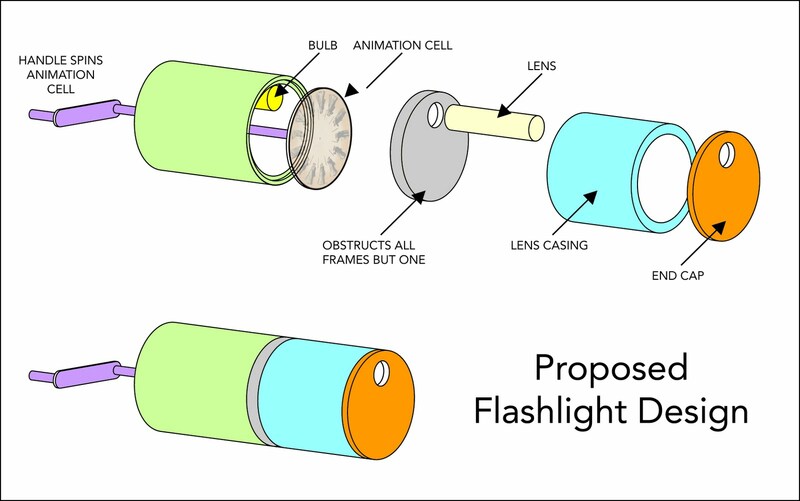 Each flashlight will contain a different animated sequence. The audience can choose how the animated sequences interact and hopefully spontaneous and unique stories will develop with each performance. gets some cool story ideas depending on the animation cycles. Thanks! Yeah that's what I was hoping for, different flashlights for different cycles and characters, kind of like a choose your own adventure. Just have to build a prototype first to see if it actually works!